This month we have a stunning giveaway from Yoola. 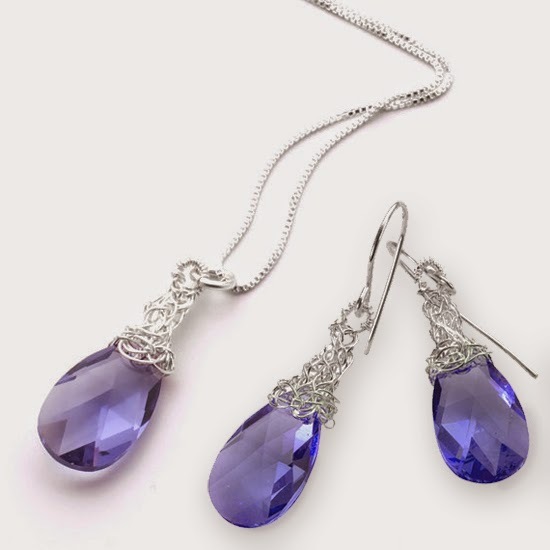 A beautiful drop shape pendant Swarovski crystal necklace in purple pastel. Embedded in a handmade wire crochet of fine silver, with matching earrings. Valued at $147. Head on over to the Yoola website to see their amazing range of wire crochet jewellery, homewares and even DIY kits to you can have a go yourself! I love the Turquoise pendant necklace wire crochet gold filled. It reminds me of earth! I love the Cleopatra Silver Necklace, just gorgeous!! On idoityourself.com, I like the vintage telegram cards, sooo cute!! I really like the Gold layered bracelet cuff. I like the Art Deco Alphabet Art. I love the burlap and lace wedding invitation! My favorite is the Pearl Pendant Gold Wire Crochet Necklace. I like the Starry Night Christmas Party Invitations. I like the Contemporary Crystal Cocktail ring. It is classic and modern at the same time. I like the Silver Necklace with Pink Swarovski Crystal , Unique Crocheted Pendant. My favorite is the XL Sunflower pendant necklace , wire crocheted flower, gorgeous! I think the wine labels are "too die for" (lol)! I love these HALLOWEEN DISGUSTING DRINKS LABELS! I love the Infinity rose gold wire crochet earrings , long elegant knitted earrings. They are gorgeous! My favorite crochet wire jewelry is the 3 Crocheted gold filled Bubble pod necklace. I love the Opal white post earrings. I like the IT DONT MEAN A THING IF IT AINT GOT THAT SWING SIGN. I like the Chandeleir Signature Guest Book on idoityourself.com.au. On Yooladesign.com, I like the Baby Blue Crystal Earrings, Silver Dangle Swarovski Earrings. The swarovski earrings and necklace are absolutely gorgeous!